Despite widespread popular approval for NASA (77% favorability rating) and an expressed interest in sending American astronauts to Mars, no more than 22% of the American public has been polled as willing to pay more for space exploration. 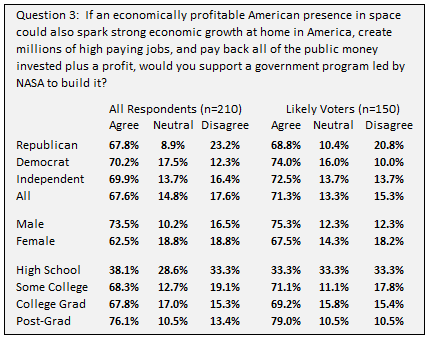 However, in a recent online survey using Survey Monkey, it was found that more than 40% of Americans were willing to spend very large sums to develop an economically profitable space frontier given two explicit caveats: If the program can be clearly linked to payback of all public money spent AND if it results in high-paying jobs being created in America. Despite a high level of interest by the American public in sending American astronauts to explore other worlds, the American public has traditionally seen space exploration as a very low priority for funding compared to other earthly priorities. In one survey, it ranked 16th out of 18 choices offered as priorities. In the General Social Survey of 2012, the percentage of American willing to spend more on space exploration was just 22%. There have been numerous attempts to explain the seeming disconnect between high levels of interest and enthusiasm for space exploration and the lack of willingness to fund it. 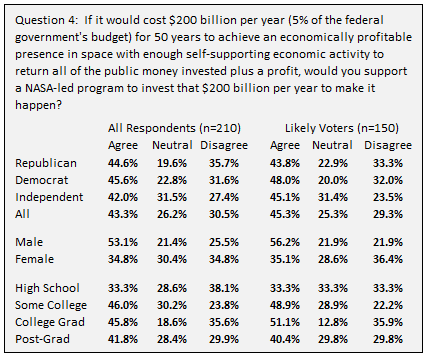 These range from suggestions that Americans don’t really understand how little of the federal budget is spent on NASA (.5%) to the premise that Americans might not be that enthusiastic for space exploration when confronted with real spending choices. An alternative hypothesis was tested via online survey that past polling of support for America’s space program has been asking the wrong questions and, therefore, deriving the wrong conclusions. Further, that when offered an option for an expanded program in space that costs much, much more, but offers the potential for a return on investment (payback), a significantly higher percentage of Americans would be supportive. The survey asked 15 questions and was comprised of three components. The first was a set of three basic demographic questions (Age, Education level, and Registered voter status/party affiliation). These provided a foundational set of data points on which to measure the participants in the survey. The second part was a modified Perry-Gallup (PG) questionnaire of likely voter participation based on six of the seven standard PG questions. The Perry-Gallup Likely Voter questions attempts to determine who are likely voters and identify those highly likely to vote in an election. Points were then scored based on one point for each question where the answer is one of those in bold with a total of six points possible. If a voter is not registered to vote (an earlier question), their total score is set to zero. Because one question was discarded in the interest of cost (Do you know where in your neighborhood to go to vote), we used a point score of five or six to identify likely voters vs. the standard scoring of six or seven. This approach may introduce flaws or be less reliable, but we believe that it is directionally accurate as it still captures participants that are a) registered to vote, b) have voted in the past, c) have expressed interest in the election, and d) indicated they plan to vote in the election. In the third section, six questions were asked about their potential support for an American space program that is distinctly different from a program focused on space exploration. Two questions were general principal/directional questions without specific numbers. The other four questions were ‘hard ball’ questions that asked participants to consider specific amounts of spending ranging from $50 billion to $10 trillion and with extended timelines ranging from 10 years to 50. All questions were phrased with terminology indicating the payback of public money was both feasible and a primary goal/rationale for funding and that earthly benefits included more economic growth and high-paying jobs. The six questions are listed below in Table 1 along with the percentage of people that were either ‘Strongly’ or ‘Somewhat’ in agreement with the question. Two data points in the columns on the right are provided – the response from all respondents and that of a subset identified as Likely Voters. The survey sample size was 210. This is small relative to standard professional polling surveys that more typically have sample sizes ranging from 1,500 to 2,500 in order to achieve a representative view of the American public. We found the data to have a good distribution between Republican, Democrat, and Independent populations and generally well distributed between different age groups (slightly skewed older) and education levels (relatively even distribution). Scoring based on the Perry-Gallup index suggests a relatively high percentage ~75% of likely voters and this may be due to choosing a ‘political’ template from Survey Monkey which it then may have matched to participants in political surveys that are more likely to be engaged. This is not necessarily a bad thing, however. Likely voters are a more indicative group when looking at potential support for future policies and Likely Voters are what politicians are most interested in. Overall, we recommend this survey and its results be considered as a directional point of view at best vs. a perfectly representative sample of what the American public is thinking. It is our hope that further research is undertaken along similar lines. Polling data over multiple decades has found a relatively small percentage of Americans are willing to spend more than currently budgeted on space exploration. It has been reported that the highest percentage of the American public that believes we are not spending enough on space exploration is 22%. The conventional wisdom, therefore, is that Americans are not willing to pay for a bolder American space program. Yet when we asked different questions, very different results were achieved. In our own survey, we used multiple questions to determine the willingness of Americans to consider an alternative to space exploration as the governing theme of America’s space program. A common characteristic of all the questions is the premise that a) that large sums invested in creating a space-based economy will create economic growth and high-paying jobs for Americans at home on Earth, and b) that a profitable space-based economy will eventually pay back all public funds invested. These questions explicitly link a bolder program in space directly to earthly priorities (economic growth, jobs, etc.) and offers a direct payback to the taxpayer. 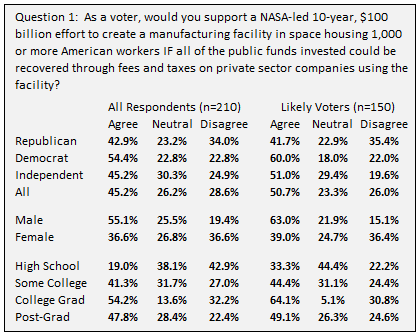 The first question tested whether Americans would support the creation of a manufacturing facility in space housing upwards of a thousand workers if it cost $100 billion over 10 years to construct, but with a strong conditional statement that all funds were paid back over time by user fees from private companies using the facility. Just over 45% of all respondents agreed (strongly or somewhat) that they would support such a program and the number increased to over 50% when likely voters were considered. Among likely voters, support was higher among Democrat voters (60%) than either Republicans (41.7%) or Independents (51.0%). Men who are likely voters were more supportive (63%) than women (39.0%). Likely voters with a college education (64.1%) and post-graduate education (49.1%) were more supportive than likely voters with less than a high school education (33.3%) or some college (44.4%). 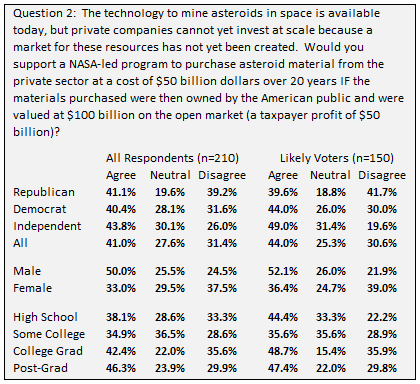 In a second question, when participants were asked if they would support a program led by NASA to purchase asteroid material from the private sector at a cost of $50 billion over 20 years that would then have a value that was nearly twice what it cost, or $100 billion, 41.0% of all respondents agreed (Strongly or Somewhat) that they would support such a program. Among likely voters, the percentage was 44.0% that Agreed (Strongly or Somewhat). Once again, men were more likely (50.0%) to support the idea of a government program to promote asteroid mining that cost $50 billion than women (33.0%). Both men and women that were Likely Voters were 2-3 percentage points more supportive than all respondents. The third question was a general principle question without a specified cost. The question tested the general level of support for the premise of an economically profitable American presence in space that created economic growth and high paying jobs at home in America AND repaid all of the public funds invested. Among all respondents, the level of support was quite high at 67.6% and among those identified as Likely Voters, the response rate was higher still at 71.3%. Once again, men (73.5%) were more likely to be supportive than women (62.5%) and the percentages for both increased among Likely Voters with men at 75.3% and women at 67.5%. Among the respondents with some college education, a four-year degree, and / or post-graduate education, the level of support was the highest, ranging from 67% to 79%. The rate among respondents with a high school or less level of education, the rates was much lower (38%), however, the sample size was very small and not necessarily statistically valid. The fourth and fifth question tested support for large-scale expenditures over extended periods of time. Question four asked if the respondent would support a space program that cost $200 billion per year for 50 years if the funding was eventually paid back in full with a profit. 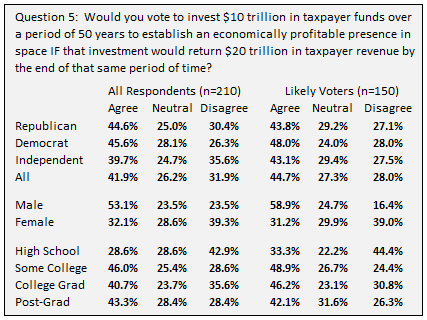 Question five proposed the same question in a different way, asking if respondents would support a 50-year program that cost $10 trillion dollars if that program would eventually return $20 trillion in revenue (a $10 trillion profit). For question four, more than 43% of respondents supported the long-term program lasting 50 years with expenditures of $200 billion per year that repaid the entire investment over time. Among Likely Voters, the number increased to 45.3%. Men were more supportive (53.1%) compared to women (34.8%) among all respondents and slightly more so among Likely Voters (men at 56.2%, women at 35.1%). With question five, the same total was raised in a different way. Respondents were asked if they would support a NASA-led program that spent $10 trillion dollars over 50 years (the same amount as question four), but then resulted in revenues of $20 trillion by the end of the same period. Roughly similar numbers were found with this question as well. Nearly 42% of all respondents agreed with the idea of a large-scale, long duration program that created a net profit for taxpayers. Among Likely voters, the total increased to 44.7%. Men (at 53.1%) were more supportive than women (at 32.1%). Among Likely Voters, support by men increased to 58.9% and among women declined slightly. For both questions, the percentage of Republicans and Democrats that were in agreement (strongly or somewhat) was virtually identical (44.6% for Republicans, 45.6 for Democrats). However, among Likely Voters, the percentage of Democrats increased to 48.0%, whereas, the percentage of Republicans that were in agreement decreased slightly to 43.8%. 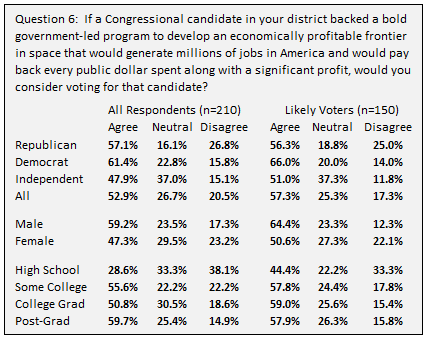 The final question asked respondents whether they would support a Congressional candidate in their district that proposed a program to create an economically profitable frontier in space that created jobs at home and repaid all of the money invested along with a profit. Among all respondents, a majority of 52.9% agreed. For Republicans, the number was 57.1% and for Democrats it was 61.4%. Independents were slightly less willing to support at 47.9% of respondents. Among likely voters, the overall percentage increased to 57.3%. For Likely Voters, Democrats increased to 66.0% whereas Republicans decreased slightly to 56.3%. Independents increased to 51.0%. Among Likely Voters, 64.4% of men agreed they would consider voting for a candidate that supported a much more expansive space program, but 50.6% of women also agreed, a slight majority. Among Likely voters, those with some college, college graduates, and post-graduates that agreed they would consider supporting a Congressional candidate ranged from 57-59%. The survey results need to be taken with some degree of caution. The sample size is small (210), the surveyed group skews slightly higher in age, and the likely voter mix is greater than the general population. The wording of the questions might be too complex or hard to follow. And it’s hard to know what respondents really thought about these questions without running some focus groups and conducting a more robust poll with a larger sample size and conducted by a professional polling firm using rigorous standards. Those caveats aside, the results open up a new line of potential dialogue. Many in the space community have grown resigned to the prospect of limited public support, tightly constricted public funding for space exploration, and competition over which mission gets funded. However, there is a possibility that the space community may have been asking the wrong questions and drawing the wrong conclusions. 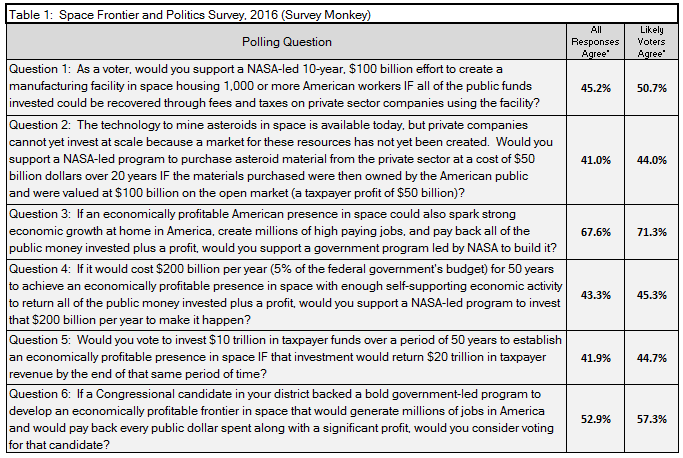 What this poll suggests is the possibility that Americans are willing to think big and spend sums well beyond anything currently considered if there is an earthly pay-off to an expansive effort to build an economically profitable frontier in space at scale. These findings are new and to my knowledge have not been specifically articulated or captured in any previous surveys or polling to date, although there have been hints in the Technology surveys done by Pew Charitable Trust that suggest Americans are expecting a bigger future in space 50 years out. This question effectively encompasses the very definition of what a space frontier means and some of its key defining attributes. What was the response? Men were overwhelming supportive with 73.5% of all respondents and 75.3% of Likely Voters either agreeing ‘Strongly’ or ‘Somewhat’ with this question. But here’s the kicker. Women were, too. Women were also overwhelmingly supportive, 62.5% of all women respondents and 67.5% of women that were Likely Voters, also agreed with this question. These are very strong majorities. As noted, these survey findings need to be explored more robustly, but when you tee up the question to ask if people support a space frontier that achieves outcomes that are economically positive for people here on Earth, there is overwhelming support and it is, with minor variations, uniformly strong regardless of political affiliations and gender. Based on educational background, it has the least support only among those with a high school education or less. The numbers drop for all groups when you get to questions that get specific on funding with specific amounts for specific durations. The number for women softens to numbers in the range of 30-35%, which is a strong core to build on, but much less than the two-thirds majority supportive of a space frontier in general. However, it is possible that support by women could be improved significantly. It may be that women’s support is softer because they are factoring the risk that funding for the space frontier could crowd out or come at the expense of other core programs (e.g. education, healthcare, college, etc.). If this concern can be answered, then it is possible that support by women for more expansive efforts on the space frontier could increase significantly. The fundamental point is that characterization of the space frontier as something that is primarily of interest only to white males appears extraordinarily incorrect. A very strong majority of women support a space frontier in concept and more than a third are supportive when you get to specific funding for specific programs which imply tougher choices. It is possible that policymakers in general have been assuming that enthusiasm for the space frontier is a fringe interest group or something only white males are interested in. This isn’t entirely wrong. Many men do like to see big rockets go whooshing up into space. I’m a man. We love that stuff. But if you begin to analyze the interest in the space frontier from a perspective of jobs, economic growth, and payback of public funding over time, then a much broader level of support begins to come into view. If you draw a direct and credible link to practical and pragmatic issues (vs. rockets going whoosh into space) that have the potential to help us resolve some of our more intractable issues on Earth, then support is much greater and this is probably true both at home in America as well as abroad among our likely international partners in any such great endeavor. What’s very interesting is that the baseline numbers found in this poll exist even before any systematic campaign to share a vision of the space frontier with the American public that is directly linked to Earthly concerns such as jobs, economic growth, and the prosperity of future generations. If a sustained campaign to communicate that vision is started, it is possible that these numbers will rise significantly. The numbers captured in this survey using Survey Monkey suggest the possibility that the American public is willing to consider a vastly larger commitment to an expansive effort in space as long as that program contributes to resolving earthly concerns for economic growth, high-paying jobs, and public funding payback. Space exploration does not offer that bargain or compact. Creating a self-sustaining and economically prosperous frontier in space does if it can be done at scale and it promises to have a positive, material impact on our economy at home. A top priority for space advocacy organizations and enthusiasts is to fund a more professional and thorough research effort to validate whether these numbers hold true under greater scrutiny.